It’s been too long since my last post, but I’ve got something I’m excited about to kick off the new year: Cornelius Applejack. Anyone who has read a few entries on this blog has no doubt encountered the fact that I am a big fan of American apple brandies and take every opportunity to try one. So, seeing this new entry at Astor Wines a couple weeks ago made my day. Cornelius is made by Harvest Spirits – whose Pear Brandy I’ve written about before – located in upstate New York, which also happens to produce an incredible volume of apples every year making it the perfect place to produce an apple brandy. The last I’d checked their site, this was still not in production, but apparently I’m not the first to get my hands on it: my bottle numbered batch 2, bottle 55. Hopefully it will live up to my excitement! Though a standard 750ml, the bottle does seem heftier than most on the shelf. This is probably a result of the cylindrical shape that narrows slightly toward the bottom. The edges are clean and sharp and the text almost gets lost among the pale yellow/brown of the contents. What ends up standing out most is the bottle numbering at the base as it’s the only completely opaque and sizable element. Instead of having text on the back as most liquors do, Cornelius has a few sentences of description running down the side. It tells us of the applejack’s namesake, a bit about the production (distilled cider, aged like bourbon), and very defiantly that there is no added grain alcohol – lest anyone think this is Laird’s Applejack. Overall this is an attractive bottle that places a good amount of emphasis on its contents rather than showmanship. I’m surprised how pale this is, so I think it must not have spent too much time in that charred white oak. It does, however, smell very much like a bourbon: a dry, spicy char to the nose with a bit of dry grasses and honey in there and (of course) apple. On tasting, it opens fairly sweet but not so much with apples; it’s more of a strawberry flavor in that first impression. This gently melts into an oakiness with strong vanilla streak that spreads out across your entire mouth. The finish is long for an apple brandy and medium-spicy. Their triple distillation really comes through in the silky smoothness throughout the whole experience. Wow. I was not expecting this at all. 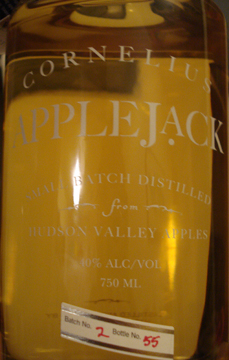 This is a fantastic spirit, but it tastes like no other apple-based spirit I’ve ever had. This is more like a very smooth, friendly vanilla-centric bourbon with just the right amount of spice and heat at the end to make it interesting. I really am impressed with Cornelius. Hopefully Astor will re-stock it soon! 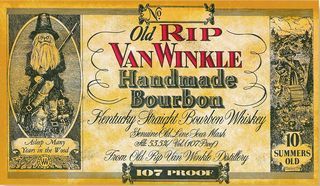 The second of the Van Winkle line I’ve tried for this blog, Old Rip Van Winkle (107 proof variety) is one of the entry-level tiers of the esteemed line of bourbons that includes the famed Pappy Van Winkles. All the Van Winkles are wheated bourbons, so I’m expecting that softer edge to come through, but the extra aging (ten years total) might complicate that a bit. Apologies for not providing my own photo here, the camera is having some battery trouble tonight. This is definitely a package that pushes its old-timeyness to the forefront. 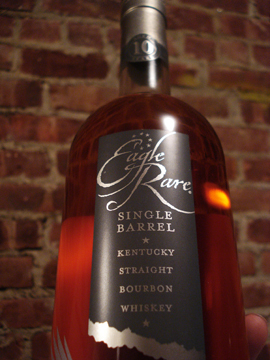 Several different fonts adorn the front label, including an elaborate script that dominates most of the bottom half. These sorts of things usually get on my nerves, but it does avoid old-timey anonymity with the two charming storybook prints from the Rip Van Winkle tale that stand on either side of the front label. Old Rip asleep with his gun and and jug of booze make this packaging unique. 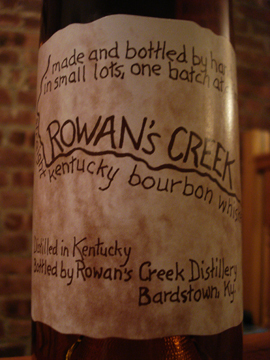 The back text, however, says nothing of substance or note and even describes the whiskey’s character as “great”. The wood from its ten years in the barrel is very strong on the nose, but backed by a honeysuckle scent and a distant hint of smoke. When tasting it, the first impression is how strongly the high proof comes through – this is a hot one. Beyond that though, the wood character is prominent but balanced by a good amount black pepper and some of sweet apple peeking through at times. The finish is medium-long and peppery. 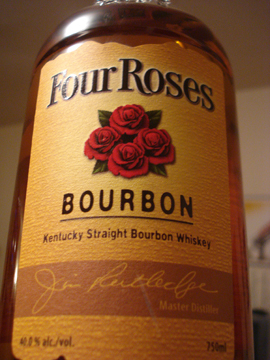 Once you get past its strength, this bourbon is quite good. It’s definitely something to sip slowly and I might even try it with an ice cube to tame the power a bit. Definitely not on the same level as the others in the Van Winkle family, but a something I’ll surely come back to. It looks like I’m about a year late on this one particular bottle. Announced and released around this time last year, Jim Beam’s Distillers Series was supposedly available only through January 2009, but I managed to pick up a bottle at Astor place just last week. I was intrigued by the friendly price point right around $20 and since I’ve enjoyed most other Beam releases I’ve tried – Jim Beam Black being one of the better bangs for your buck. Then again, maybe there’s a reason this “limited” release is still on shelves a year after it hit them. – Jim Beam Distilling Co.
JB Distillers Series comes in the classic Beam bottle, but has done away with the classic paper label. Along the sides are six of the past distillers for Jim Beam: from Jacob Beam on the top left to Booker Noe at the bottom right. Right up front is the current distiller Fred Noe. Beside each miniature portrait is a brief, nostalgia laced biography. Other than these portraits and biographies, there isn’t much. No description of the whiskey beyond the age. No old-timey flourishes. Nothing much but the clear glass bottle. One hopes that this is because they believe the contents need no introduction beyond sight, but really it seems they’re so singularly focused on their genealogy that they may have lost sight of what these men were actually making. This is definitely a Jim Beam on the nose, but in a richer, sweeter way. I’m getting sap and honey in there with some dry oak. On the tongue, this is much smoother than I’d expected and than most other Beam releases. There’s definitely that dry oak flavor to it and a sweet, warm finish. Up front there’s also a bit of hay or dry grass. I do get the sense that this is a little thin for all its smoothness, however. This is not something that is particularly interesting or exciting, but it is quite good for its simplicity and smoothness. The best way to describe Jim Beam Distillers Series would be ‘austere’. The ultimate test for whether I like something is if I pour myself a second tasting as I finish the review, and this one certainly passes.